It’s felt like spring for a while here in Whistler. By now, we’ve fine-tuned our spring skiing habits (as evidenced by traces of goggle tans appearing on faces around town). If you’re hoping to brush up on your spring skiing how-tos, you’ve come to the right place. Here’s what you need to do to make the most of the season. The only certainty with spring skiing is that conditions will always be changing. That bluebird day could disappear as soon as one menacing cloud creeps along, just as a rainy day in the Village could translate into a late-season surprise pow day in the alpine. There’s an easy solution to dealing with the tumultuous weather: layers, and lots of ‘em. Resist the urge to skip out on a mid-layer even when it’s balmy in the valley. Your best bet is to bring along a backpack and stash some extra layers inside. Don’t forget to pop in a neck warmer and toque, even if you don’t think you’ll need them. You already know that you should wear sunscreen 365 days a year. When you’re up high in the mountains with the bright spring sun reflecting off the snow, you’ll definitely want to be wearing some SPF on your face. Don’t forget lip balm with SPF! Did you know that there’s such thing as warm weather wax and cold weather wax? There is, and you should tune your gear accordingly. Spring skiing conditions can be especially rough on your skis and snowboards, peeling away wax much quicker than you think. Don’t let your plank(s) dry out – wax often! Nobody enjoys scraping down icy patches of snow. The solution? Follow the sun! 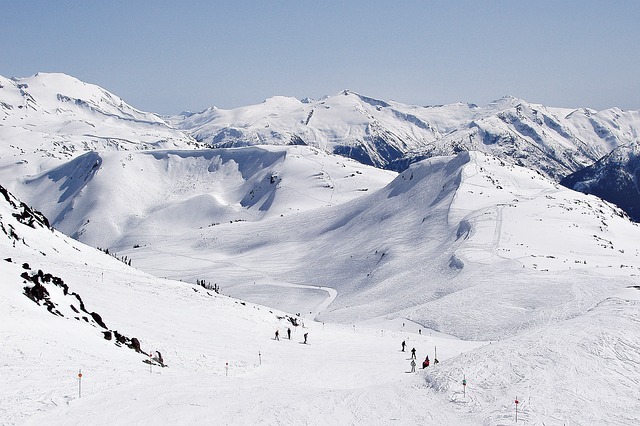 On Blackcomb, the 7th Heaven zone tends to soak up lots of sun, while Harmony is often a sunny bet on Whistler. There’s a reason that the parks on Whistler and Blackcomb get a little congested in the spring months: it’s the best time to work on jumps, spins, rails, boxes, and other fun features. New to the park? Test your skills on Blackcomb’s Terrain Garden, or stick to the small features in the Whistler Park. It’s well worth signing up for a lesson to learn the ropes. Sure, you could download on the gondola – or you could plow your way throw piles of slush as you brave the ski out. Skiing in slush is surprisingly fun – and, as a bonus, slush is especially forgiving when it comes to tumbles and spills. Watch for rocks and other debris on your ski out. Fair warning: you might not want to take your finest pair of skis on the ski out. Many would argue that the best part of spring skiing is the cold beer you’ll enjoy on the sun-soaked patio afterwards. Whistler is spoiled with perfect patios. Pick your poison, and raise a glass to another awesome day on the hill!